Fed up with the limitations of your standard budget lightweight. PE Gazebo & broken components? With a packed down weight of 130Kgs, this is a typically superior and more substantial gazebo than it's rivals. It looks super as well, so Go Compare! Are you arranging a garden party, are you researching gazebos or considering replacing a lightweight gazebo? Would you like to step up the gazebo ladder and own a seriously re-usable gazebo/marquee. That you can depend on to give your occasion that garden/summer atmospheric that gazebos do so well? Ours is a heavier duty 9m x 4m party gazebo comprising a sectional 45mm diameter powder coated steel frame with. 50mm diameter steel screw fixed connectors. The canopy is 300g/m2 heavy duty. PVC backed and waterproof polyester. 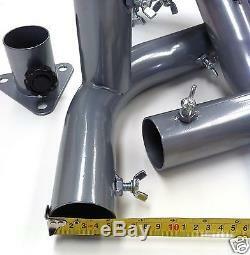 The main restraints are heavy duty `screw in` ground anchor pegs. 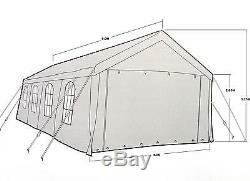 Complete with ratchet governed guy straps to aid stability and better secure your gazebo. 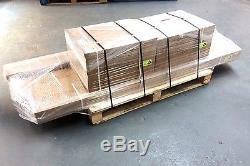 This is a substantial product with a packed down weight of approx 130kg, you will be able to assemble it year on year. To enjoy those summer moments and it will be backed by Octopus-Leisure`s on-line spares support. Please advise a daytime contact telephone number in order to arrange a convenient. HOW MANY WILL IT HOLD. Occupancy level depends on 4 things, are you planning a standing function, island seating or banqueting seating and ultimately expectations of comfort. Normal rules of thumb would have a 9 x 4 space comfortably accommodating 50 - 60 people standing, you can work backwards from there depending on how much circulation space you wish to allocate.... Banqueting is likely to provide approx 40 places and island seating maybe 25 - 30. 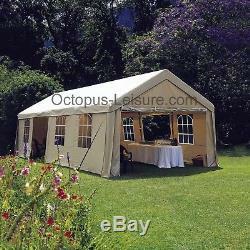 Want an attractive Party Gazebo/Marquee. Avoid the white PE commercial look. Heavy duty coated 45mm & 50mm diameter tubular steel frame & connectors. Two full-length side panels with heavy duty zipped entrances that can be rolled up & tied back. Two end panels with heavy duty zips that can be rolled up & tied back. Backed up with UK spares support. 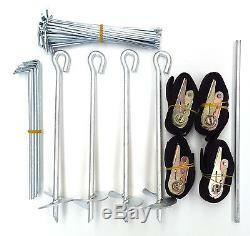 Includes 4 heavy duty screw in ground anchor pegs & ratchet governed guy straps. PVC backed canopy, 30 0g/m2 Polyester in an attractive muted shade, Note: colour monitors can vary. 40 Small ground pegs 250mm long. 14 Medium ground pegs 310mm long. Wing screws / nuts for securing each pole to connecting joints. 60 Bungee ties for securing canopy & side panels. Postcode and non UK mainland restrictions apply. All island, Northern Scotland, IOW, and some Lowland. Should you live in any of these surcharge locations. We cannot currently deliver to Ireland, Eire, the Isle Of Man or the Channel Islands. The item "Large heavy duty garden gazebo, marquee, wedding, carport tent 9 x 4m (Taupe)" is in sale since Wednesday, October 10, 2012. This item is in the category "Garden & Patio\Garden Structures & Shade\Gazebos". The seller is "octopus-leisure-uk" and is located in Liverpool. This item can be shipped to United Kingdom.